Sometimes good things do come to those who wait. I bought the three print volumes of Walkin’ Butterfly from now defunct publisher Aurora, and was sad when the publisher went out of business before the 4th and concluding volume was issued. So I was really excited when I saw more Ohzora titles start to appear on Jmanga and even happier when I heard that they were working on the translation for volume 4 of this series. If you are a fan of romance manga and want to enjoy one of the few completed series on Jmanga.com, you owe it to yourself to check this series out. The protagonist of Walkin’ Butterfly is Michiko, a tall gangly tomboy who has been ostracized due to her freakish height. She has recently graduated from high school, but her life is aimless. She works on cars, crashes motorcycles, and gets into fights due to her violent temper. Since she is terrible at dealing with people, she’s often gets fired. Michiko comes home, stomps past her mother and curls up in her room, concluding that she is “Like a monster built by a mad scientist. Neglected by everybody…and completely unlovable.” The one bright spot in Michiko’s life is her friendship with Tora, a truck driver with a sunny disposition who speaks to her as if she’s a person and not a problem. Michiko is in love with him, but he thinks of her as a little sister. When Michiko starts on one of her latest dead-end jobs in food delivery, she gets lost and wanders near a fashion show. She’s mistaken for a model due to her height and before she knows it, she’s been sent to hair and makeup and is wearing an elegant gown. When she gets a glimpse of herself in the mirror, she points and yells “Who are you?” Michiko observes the other models and assumes that walking down the catwalk is a ridiculously easy job. She’s lounging backstage laughing to herself when the designer Mihara quickly spots that she isn’t a model, says that he feels sorry for his clothes and that she’s “just an ordinary amazon.” Michiko flings herself on the runway in anger, freezes up due to the attention of the audience, then runs away in panicked humiliation. As the series progresses, I was impressed with how naturally Michiko’s personality changes as she matures. Becoming a model to spite Mihara might be a goal that seems a bit silly, but this is the first time that Michiko has worked towards something that is meaningful to her. While she still tends to exhibit signs of her previous flight or fight responses to setbacks, when Toga becomes ill, Michiko starts seizing responsibility for her own bookings, pursuing her goal on her own. Michiko and Mihara get thrown together on a trip and he continues to find her puzzling, wondering “Was she always so free like that?” when he sees her laughing. Michiko becomes cheerfully persistent, showing up at Mihara’s studio and occasionally helping out even though he has stated that she won’t be allowed to audition. Mihara’s decisions seem partially driven by his curiosity to see what Michiko will do next when faced with a new obstacle. The Michiko in this volume is still incredibly determined, but she’s no longer showing the violent excesses of emotion that derailed her life before. She begins to learn more about Mihara and the difficulties in his own situation and develops some empathy for him. For all that Mihara seems to be tightly controlled and focused on his business, in his own way he’s experiencing uncertainty and moving forward as best he can, just like Michiko. 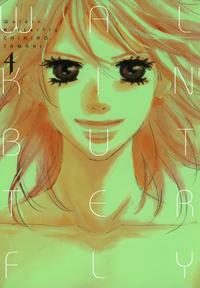 The covers of the volumes of Walkin’ Butterfly provide a capsule portrayal of the changes Michiko goes through in this series, as she’s shown starting off hostile, becoming closed off, taking tentative steps to opening up, and finally approaching life with a confident smile. Michiko faces down a test in the final volume of the series, and she decides to carve out a happy ending her own way, instead of relying on having opportunities handed to her. It was interesting to compare Michiko’s facial expressions in the first and last volume of Walkin’ Butterfly, because I could see how the effects of her internal transformation had changed her. Michiko in the final volume is open to new experiences and appreciating the people around her instead of being locked into a shell of self-pity. Tamaki’s illustrations are certainly stylish but they don’t evoke the overwhelming devotion to detail and a specific style that you see in a series like Paradise Kiss. She does a great job portraying the dissolute and run-down air of vetrans of the fashion industry when compared to the more young and hopeful pair of Mihara and Michiko. As a romantic hero, Mihara starts off by being very self-contained, and the reader gets signals of his reluctant fascination with Michiko mainly through sidelong glances and the way his mannerisms begin to change during the few moments they are alone together. Five years between the third and the fourth volume was a long wait, but going back and rereading the series and being able to finally read the conclusion ended up being very rewarding. Walkin’ Butterfly has much more emotional depth than you might expect from a series focused on a girl transforming herself through modeling, and it is worth checking out if you enjoy romance manga with fierce heroines. I’m very happy that the entire series is available in English, even though it was quite a wait to get it. It is a really solid josei manga, and it is too bad it isn’t in print anymore!